Greying of hair is natural with age, but when hair starts greying early we often wonder why? Greying of hair is caused due to decreasing levels of melanin in the hair roots. Melanin is a natural pigment, which gives hair its dark colour. Thankfully science has the answer and now Marico’s True Roots offers a solution to delay hair greying from the roots. Marico’s True Roots Botanical Hair Tonic, is a first-of-its kind innovation, that works by increasing the melanin levels in the hair roots and stops^ new grey hair. It is formulated at TrueRoots Lab with Apigenin, an extract of chamomile flowers and other powerful botanical actives that increase the melanin levels in the hair roots. True Roots is a revolutionary botanical hair tonic that stops* new grey hair from the roots. 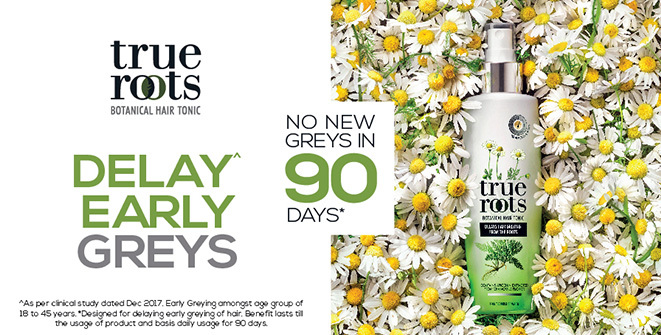 True Roots Botanical Hair Tonic is dermatologist tested and clinically proven to show no new greys in 90 days. ** True Roots Botanical Hair Tonic is easy and convenient to use and comes in a delightful spray format. Its aqua based, non-sticky formula gets easily absorbed in the hair roots & does not need hair to be washed off after usage. In addition to increasing melanin levels to delay greying, it also makes hair healthy, soft and provides conditioning. ^&** Basis clinical study. Designed for delaying early greying of hair amongst the age group of 18-45 years. Benefits lasts till usage of product. Continue usage even after greying slows down.